Administered at every feeding, Drip Clean helps to remove salt particles and dirt from the root structure, hoses, and medium of any garden. Drip Clean is compatible with all mediums and solutions. Drip Clean is safe for any plant and can be used with tap or filtered water. As an added benefit, House & Garden’s proprietary blend helps to reduce flush times at the end of every harvest. Ingredients Explained: Salt build up can cause nutrient lock out, negatively affecting plant growth. 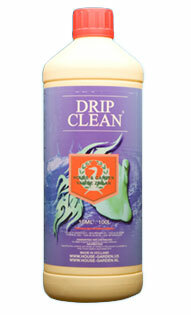 Drip Clean works to give your plants and medium a clean slate. House & Garden maintains their own nutrient manufacturing facility as well as their own laboratories where they continually test each batch of fertilizer they produce. This ensures that gardeners employing House & Garden receive high quality, consistent products.